One of my favorite things to do is spend most of the day outdoors with my camera, seeing what I can see. I started early the other day and went down to the ocean at 7:30 a.m. for low tide. I've been seeing a seal that likes to fish at that time of day. Instead of a seal, I saw a bald eagle come flying towards me with some crows calling, in hot pursuit. 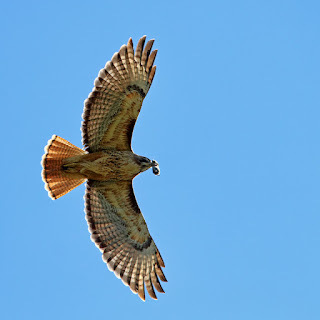 It always amazes me when I see smaller birds chasing a large bird like an eagle or a hawk. Crows especially love to harass raptors and I've seen it time and time again. Anyway, the eagle landed in my neighbour's yard, which was quite unusual. 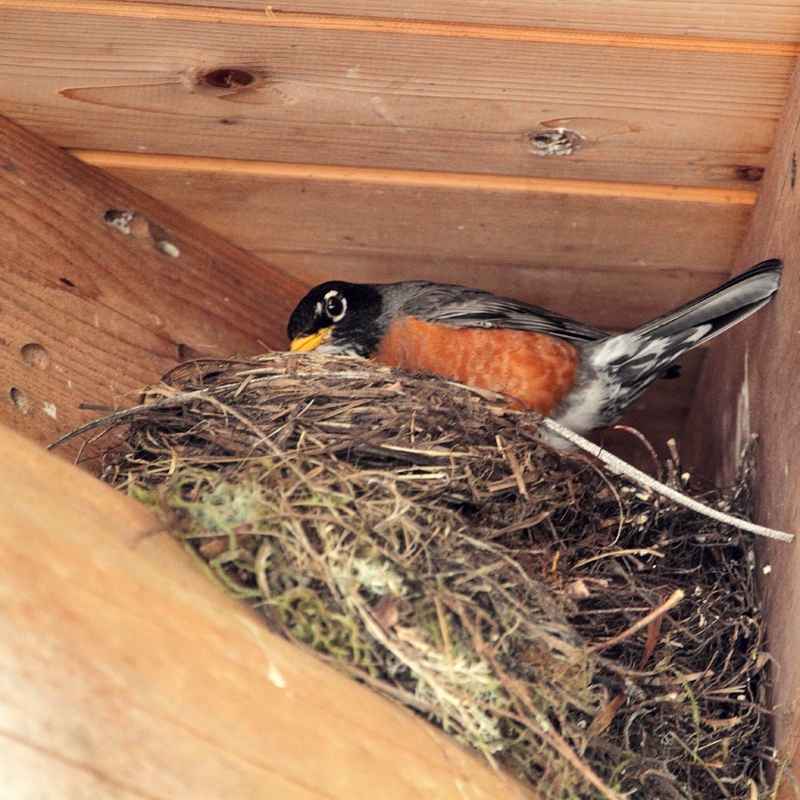 Since I was down on the dock and couldn't see him in the yard, I waited for a minute to see if he'd fly off again. When he didn't, I crept up the dock ramp to try to surprise him. Unfortunately I was halfway up the ramp when he flew off and I totally missed the shot. He was about 20 feet away...so close! 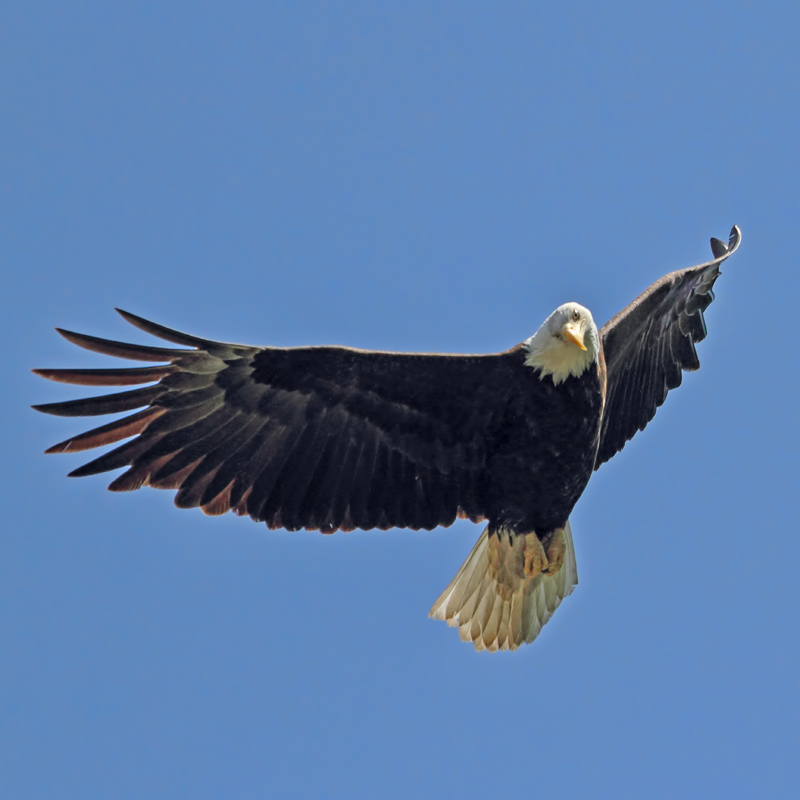 Returning home, I heard a fluttering of wings and saw large birds flying to various trees. I thought at first that a hawk was in our yard again. 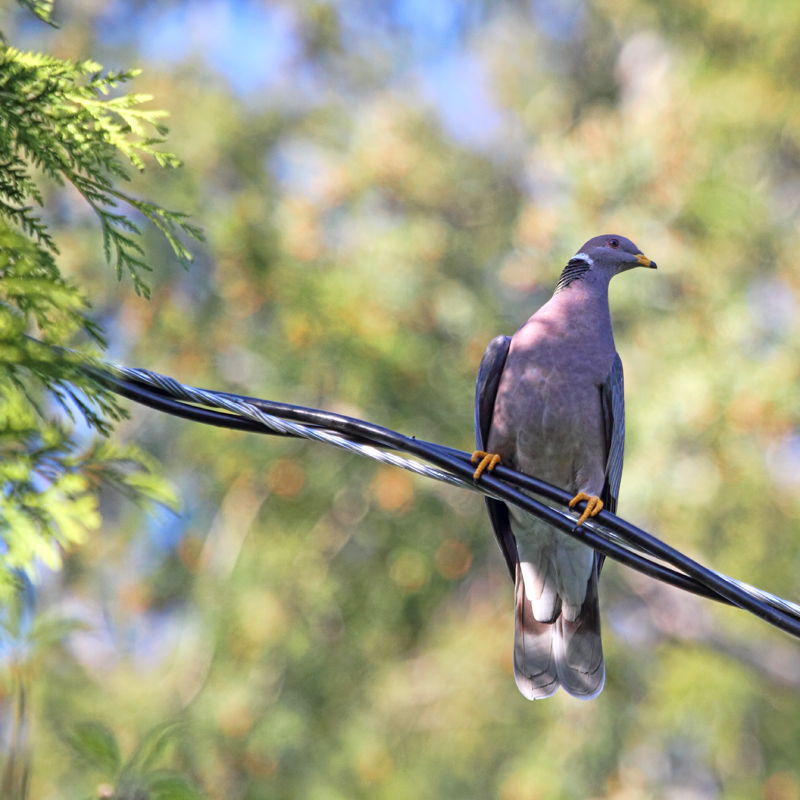 But no, it turned out to be several band-tailed pigeons. We've never had them in our yard before. Such pretty birds! One of the pigeons later ate some seed from our back deck. The pigeons are still around the house several days later and at least one of them has enjoyed his seed breakfast each morning Chez Peggy. My husband and I then drove to one of our hiking spots to walk our two dogs. We often walk on forestry roads that are along the power lines. On these hikes I've seen (and photographed) bears, a wolf, two bobcats, many elk, coyotes, and lots of birds. On this particular day we saw a hawk in the distance. My husband called it using his very bad imitation of a hawk. Surprisingly, the hawk flew right towards us! I saw that it was a red-tailed hawk. It began circling us over and over again. It was wild! I've never seen a hawk do this. I trained my camera lens on it and realized that it had a mouse in its beak. The hawk seemed to be showing us his prize. It must've circled us 20 times and eventually I noticed the mouse was gone...I assume he enjoyed his meal while flying. After our walk we drove to the Iris Griffith Centre, hoping to see some baby painted turtles hatching. It's the right time of year to see this phenomenon but we weren't so lucky. The nature trails were very quiet on that morning except for a few tree swallows flying around and a robin in her nest on the centre's building. We then drove to the nearby Ruby Lake Resort, where Aldo, the owner, kindly let me snoop about the grounds to take pictures of the birds. Aldo is a fellow bird lover so he understands. He pointed out a family of Canada geese with six goslings across the gorgeous, shimmering lake. I crossed the bridge with tree swallows darting about, seeming to lead the way. I found the goose family and sat for awhile, snapping pictures. 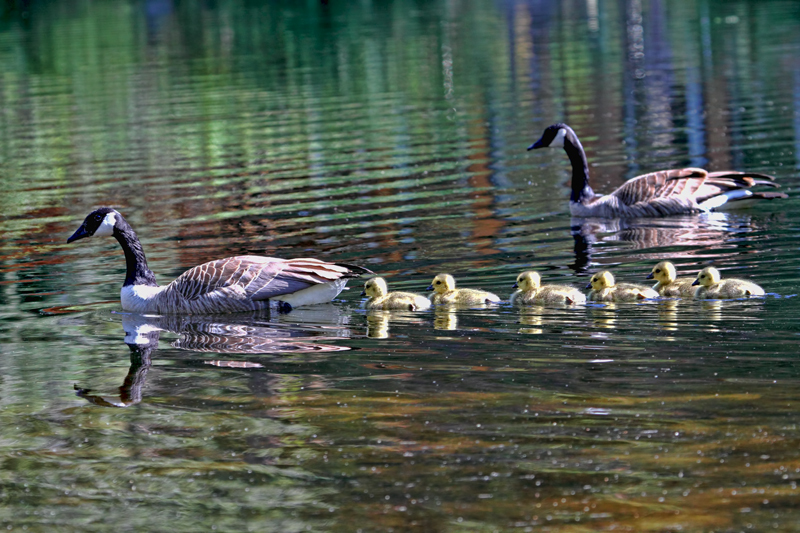 Eventually mom and dad goose led their babies to the water and they went for a swim. The barn swallows had returned to build their nests in the eaves of the Ruby Lake Restaurant's walls. 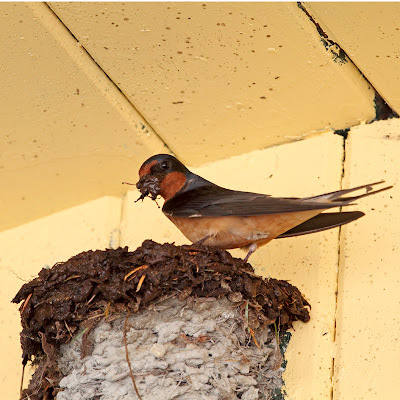 I watched as a swallow worked on one of the nests. O.K., this might not be the prettiest picture I ever took, but I thought it was interesting. It looks like the bird was adding mud to the nest. So as you can see, we have an abundance of wildlife here on the Sunshine Coast of British Columbia. I'm practically guaranteed to see something interesting every day. I sure like living here!